Having spent my pre-Google career as a reporter and editor at legacy media organizations, I can tell you that digital transformation in the news industry is challenging. Even when news organizations have the will, resources and technical expertise, the obstacles to transformation can be daunting. In Asia, few news organization have plunged headlong into digital transformation like South China Morning Post, Hong Kong’s top English-language daily newspaper. With a daily weekday circulation of roughly 105K, SCMP is a midsize paper, but its language and geography give it outsized influence. For more than a century, SCMP has been documenting Greater China for the English-speaking diaspora across Asia-Pacific. Before the internet, expatriates and visitors would pick up the paper, sometimes days old, on airplanes and in hotels across the region. For those living in mainland China (like I did in the 1990s), the paper offered a window into the place where they lived, from a familiar yet discrete vantage point. Now, SCMP uses the web to reach the growing global community of readers interested in news about China, and experiment with new methods of storytelling along the way. After its purchase by Alibaba’s founder Jack Ma in 2016, the newspaper suddenly had a mandate to evolve, and was given the runway and resources to experiment. “Culture and identity are massively important when you are trying to turn around a 114-year-old company … until you have a company that is ready to experiment, willing to fail, and able to move with agility … you can talk all day long about transformation and where you’re heading but you’ll never get there,” said SCMP CEO Gary Liu in an interview with Harvard’s Shorenstein Center on Media, Politics and Policy. That entrepreneurial spirit led SCMP to take on an immersive virtual reality project that would trace the history of Hong Kong from British rule to the present day, mining a century’s worth of archival photos and illustrations and presenting them alongside modern-day 360-degree video and drone footage. The project was Google News Lab's first immersive storytelling partnership in the Asia-Pacific region, part of the team’s broader effort to accelerate immersive storytelling across the news industry. “It had to be big, bold, and beautiful—and leverage new formats, technologies and platforms to tell the story,” according to SCMP online editor Brett McKeehan, who helmed the project and talked about the process at a recent Google News Lab event. In order to make the project accessible to as many readers as possible, especially in the smartphone-dominant Asian market, the SCMP team built a responsive website that was optimized for mobile, tablet and desktop. Animations of 3D Google Earth imagery helped to tell the story and orient the reader across time and space throughout the piece. One of Hong Kong’s wettest Junes in history. And then it rained. And rained and rained—for six straight weeks—one of Hong Kong’s wettest Junes in history. While it rained, the Hong Kong government changed its drone restrictions, rendering certain planned shots illegal. Meanwhile, SCMP’s developer team of three learned how to build, for the first time, a responsive HTML webframe that would work for both iOS and Android. 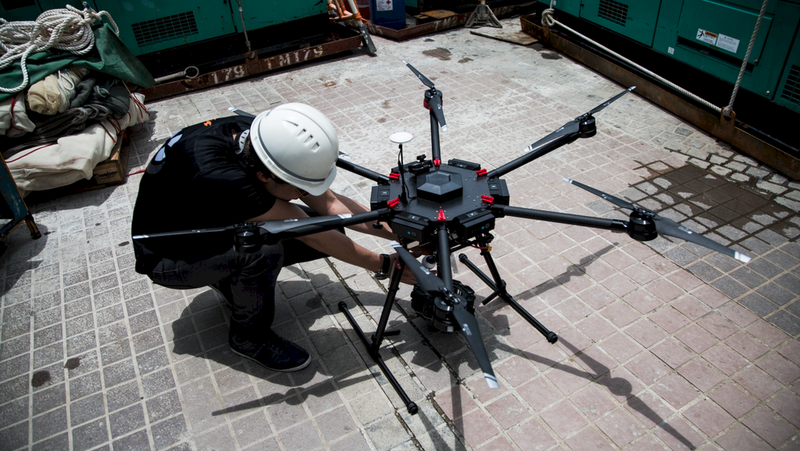 A drone is being readied to capture footage across Hong Kong. In the end, Brett and his team had to change their project scope and push back their release date to overcome the many unforeseen logistical and development challenges that sprang up throughout the process. Embrace the medium: 360, VR, AR offer incredible storytelling possibilities. The sooner you take the plunge, the better. Experiment with new technologies, but start small before taking on more ambitious projects. Don’t outsource: Bite the bullet, buy your own equipment (get cheap stuff and play). Own your ideas and develop your own talent. “We’re an aspirational publisher. We’re doing something for the first time. So we made it; we’re happy with that,” McKeehan said.